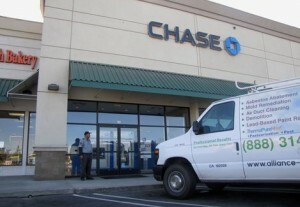 A Chase Bank branch in Modesto fell victim to a strange hazmat situation the other day, sending 6 employees to the hospital, and Alliance was called to the scene! It seems that a 30-something man brought a large amount of cash wrapped in a paper towel to the bank branch on Friday, intending to make a deposit. But he deposited more than money! Minutes later, it was reported, the teller who received the cash and others with whom she had had contact developed a range of symptoms from hives and blisters to difficulty breathing and fever. And what began as a medical response soon turned into an even more traumatizing situation when hazmat teams made those who had been exposed to th toxin shower behind tarps outdoors, first in their clothes and then out of them! They were then provided with white "clean suits." The cash was tested for contamination but there is no word yet on what the substance was nor who the perpetrator was, although it was reported on the news that the home of the suspect was under surveillance, so I guess those security cameras are not just there for show. Alliance Environmental Group was called in to decontaminate the entire bank branch and our team did a quick and thorough job, allowing the branch to re-open. We hope no one finds themselves in this kind of situation, but if you do, Alliance Environmental Group is ready to help!